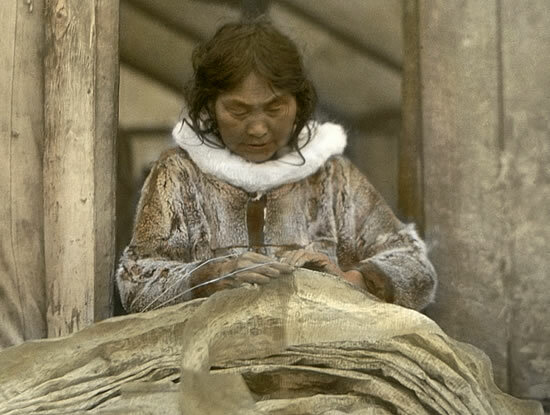 Cupungulria from Canineq, who was left-handed, sewing a seal-gut parka. Arnat tua-i mingqurnaurtut tua-i tan'geqicuunateng. Women constantly sewed, and though it was dark they could see what they were doing. Waten yuut tamakut eliqneruarateng-llu egcuunaki, tumarqurluki caurtaqluki. Qanganaam iigken akuliik; tua-i usguqu'urluki qercurtarrarmek qukalirluki. Aqevlequssaari-wa qanganaam aqsanri. dried skin between each fur piece. And the hanging decorations were made from the belly part of the squirrel skin. A woman's ability to sew and repair clothing was critical to her husband's success as well as the whole family's survival. A girl could only become a wife after she learned to sew. Men sewed repairs for themselves while out hunting. 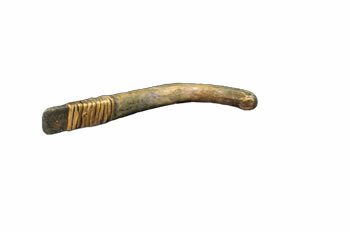 Skin scraper with long handle for extra leverage. Annie Blue noted: "We use this to scrape and tan skins. We have to keep stretching the skin and remove the top skin layer until it looks good." The connective tissue in skin grows in layers. The outer layers, which are not as tightly cross-linked, can be broken down by heat and then scraped away, leaving the thicker, most flexible layers underneath. 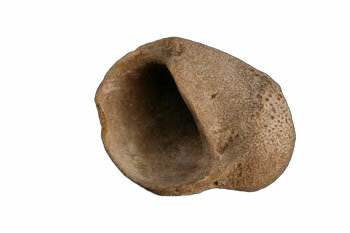 Sewing bag from the tundra region, which held a woman's needles, thimble, sinew thread, small knife, and whetstone. Phillip Moses recalled: "Some men also kept them in their pockets. If they tore something or their skin boots ripped, they could sew it. I still sew up to this day." 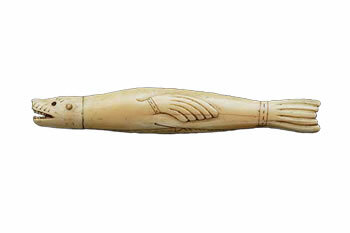 Fish-shaped needle case from the lower Yukon River. 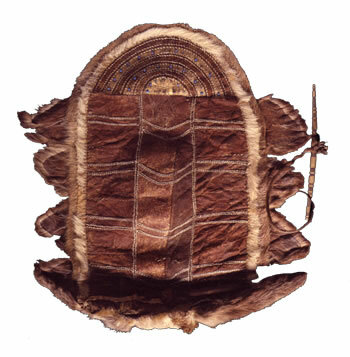 Seal-shaped needle case with removable head, from Nunivak Island. Needles made of squirrel bone. Theresa Moses noted, "They stored their needles by poking them in the sewing bags." 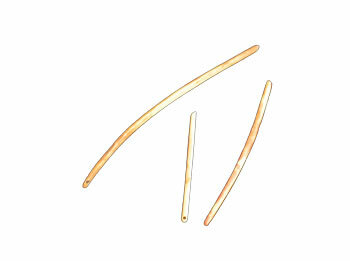 Needles might also be stored in ivory needle cases or the hollow section of a swan wing bone. Akngirnailitaq/Shell thimble Betty Huffmon said that people went to the foot of Beluga Hill, on the north shore of Goodnews Bay, to collect shells like this to use as thimbles. Neva Rivers remarked, "I don't know how to sew without a thimble." Slate-bladed woman's knife from Cape Vancouver. 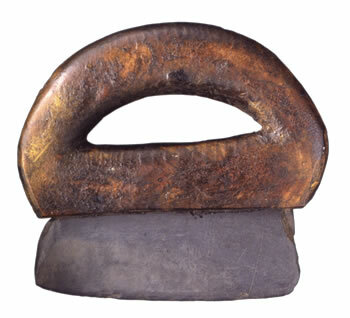 Annie Blue said: "This was made to be an uluaq before metal came. When sharpened it could be used to cut open and skin any furred animal." 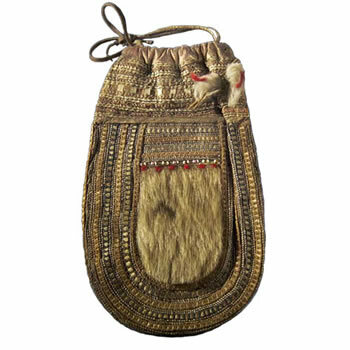 Kellarvik/Bag decorated with kelurqut (fancy stitches) made by sewing caribou throat hair and sinew on thin strips of dyed skin or bird-foot leather. Elena Charles commented: "The first people worked very hard and did a wonderful job with their work. The ones I observed would sew without stopping. They called them munalriit [ones who are dexterous]. They put lots of very small stitches on this sack." Elena Charles said: "That is a ring that represents the world. Here are the winds--north, south, west, and east. 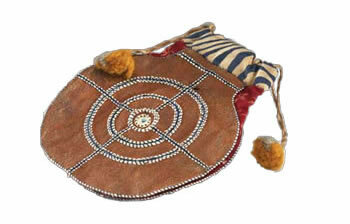 When they made marks on a round object that represented the world they called it ellanguaq [pretend or model universes]." 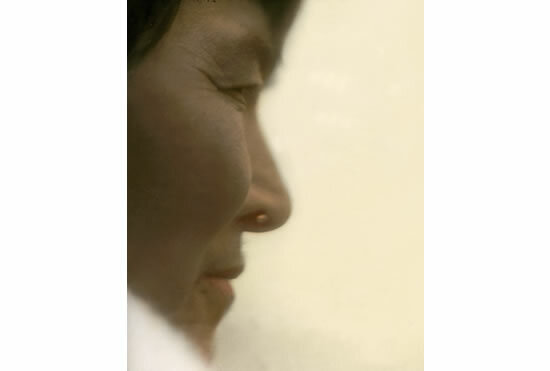 Woman with a pierced nose. Martina John recalled: "I envied those who had holes in their noses when they had seal party distributions. Back when they weren't wealthy and when they gave each woman a needle, those with pierced noses would put them through their holes. They were so desirable when those needles were poking out." 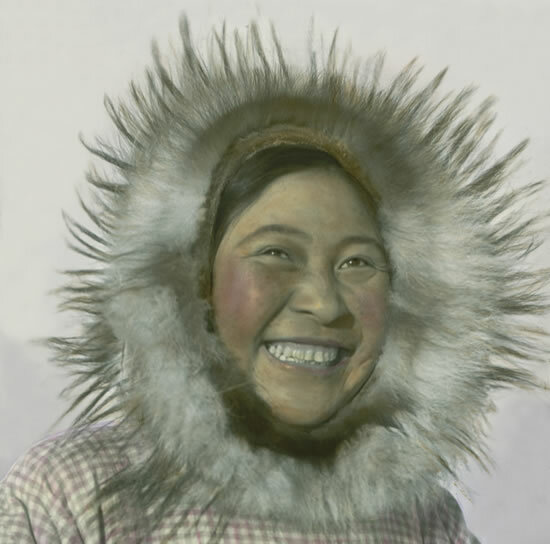 Mary Ann Sundown wears a parka with a beautiful sunshine ruff made with wolverine and the guard hairs of wolf on the outer rim. Wassilie Evan said: "Sometimes the windward side of the face gets really cold, but ruffs break the wind."